Today it is seen as an undeniable truth that the barest minimum for Arsenal to achieve each year is 4th position in the Premier League. No matter that other teams have far more money than we do, it is seen as our inalienable right to be at the top. Except it wasn’t in those days. So what went wrong? In fact the table could be made to look even worse, if we record all the years since Arsenal won a trophy (1952/3). Tom Whittaker, who managed us to that win, was replaced by Jack Crayston during the 1956/7 and George Swindin came in, in 1958/9 taking us to third in the league. But after that it was downhill all the way. In 1959-60 they were involved in some epic FA Cup battles with mighty Arsenal. The teams drew at Millmoor in a third round tie and against the odds they drew in the replay at Highbury in front of a crowd of 57,598, the highest ever for a Rotherham game. The Millers won the toss to stage the second replay, which was staged at Sheffield Wednesday’s Hillsborough ground, where they pulled off a memorable 2-0 win. Arsenal’s team became quite a mess that season with numerous changes of line up and position. Len Wills played games at right back, left back, left half and right half. Tommy Docherty played at left half, right half and centre half, Mel Charles turned up at right half, centre half and centre forward, Vic Groves played at inside right, left half, right half, centre forward and inside left, David Herd played at centre forward, outside right, inside right, and inside left in different games, John Barnwell was used at inside left, inside right, left half and right half. There was in fact by January no way on knowing what the manager might do next. Only three players managed to play all three games against Rotherham in the same position, although only 15 players were used across the three games. But it wasn’t just the cup matches that resulted in poor results. In the league we lost 0-3 at home to Preston, 2-4 at home to WBA, 1-5 away to Sheffield W, 0-3 at home to Luton Town, 0-3 away to Tottenham, 1-4 at home to Chelsea. There were some good bits in between, such as a 5-2 home victory over Manchester United in the last home game of the season, but mostly it was gloom and doom. I’ll take a look at the manager and some of the players in subsequent articles. I’m pretty sure the 5-2 v United was the last time I left a game early. I missed our 5th goal because I was already late for my evening paper-round. Have never done that since for about 1200+ home games. Early leavers eh? Can’t stand them….Also memories of Denis Evans – he of the classic own goal – he used to live locally in Chesterfield Gardens, Harringay. But then they all did in those days. Mel Charles – not a patch on his elder brother John of course. Mel could head a ball but couldn’t do much else. Interesting how weak we were in this era. Mel Charles 6 caps for Wales, Haverty 15 caps for Eire, Magill 21 for Northern Ireland, Docherty 3 for Scotland, Henderson 2 for Scotland – all nearly men. And the rest mentioned not an international cap between them, even for weak home nations teams. lost 0-3 at home to Preston, 2-4 at home to WBA, 1-5 away to Sheffield W, 0-3 at home to Luton Town, 0-3 away to Tottenham, 1-4 at home to Chelsea. What I would like to know as I continue to ponder this situation is whether any other manager did this sort of endless swapping of positions. Looking at the team sheets across that season the club didn’t use a massive number of players, it is just that they played in all sorts of different positions. Probably the best thing in those days was getting home to watch Whirligig on the old black and white T.V. No, I’ve got that wrong! It would be the early/mid fifties after watching the likes of Gordon Nutt and Mike Tiddy that I used to dash home from the match to watch Whirligig. From the wide-eyed age of 13(1959)until I emigrated to S.Africa in 1968 I faithfully watched Arsenal, in hope, and generally despair. I attended most home matches, and travelled occasionally, once to Leicester, and saw them thrashed (2-7) I think it was. Were you there with me when they lost 0-3 to Leeds at Highbury with a few others and their dogs (remember that low attendance?) Besides a few shock wins my side generally let down my intense but possibly misplaced faith in their greatness, so of course, the moment you abscond to TV-less S. Africa, they start winning! From time to time I have returned to visit family, the last time to watch Henry and Pires fanny-around with THAT penalty against Man City. But those 9 years are etched deeply in my memory. Mad McGill & McCullough at fool-back (they weren’t that bad), 6ft 13 Ian Ure who couldn’t head a ball to save his life, but curiously had great feet, George Armstrong – who ran all afternoon, Alan Skirton’s penalties – he hit them straight, but so hard – the goalkeepers deliberately dived to avoid being hurt. GREAT MEMORIES, and if we were lucky – the occasional win! Re the Leeds game the crowd was about 4,500,nobodys remembered Terry Neil,the most underated centre half and the most overated manager,but what a penalty taker similar to Alan Skirton sadly I never watched one I would shut my eyes his run up started at the half way line. As a 7 year old, I started as an Arsenal supporter this season, and witnessed some of the matches you mention. Luton were relegated that season, but it didn’t stop Arsenal losing 0-3 to them on Boxing Day. Struth! That was my first team debut. All I can remember of it is the size of Jackie Henderson’s enormous thighs. 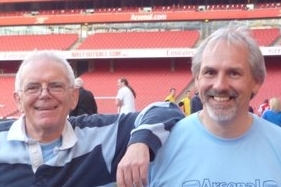 So my Dad made my first stool for me to stand on and we took our place at the Clock End for my first win: 1-0 over Newcastle (John Barnwell penalty, 60 mins). A few weeks later, though, was the 1-4 defeat by Chelsea. I got home in time to see the re-run of the finish to the first televised Grand National (won by Merryman). Many years later I discovered that this moderate Arsenal team had somehow managed to finish third in the league the previous season. How? The last home match of the season was the 5-2 win over Man Utd. Leading scorer David Herd was injured and I believe that Vic Groves was pressed into playing centre forward. The crowd coudn’t be more pessimistic. And Arsenal won – as they often would against United in the 60s. Subsequently I’ve read articles stating that there was a strong suspicion at the time that the match was fixed. Apparently, even for those days, United had some very strange, erratic results around that time. Anyway, I was now an Arsenal supporter and condemned to a boyhood of miserable 60s Saturday afternoons. just stumbled across this. I was at all three Rotherham cup games! Good foundations though for being an Arsenal fan! I’m trying to remember a Cup replay at Bramall Lane when Jack Kelsey broke his arm and played on wing with arm in a sling. Think Keith Kettleborough scored hat trick against us to win. Another stone laid in the foundations!